A long time ago, in a place that now seems so far away, I sat and suffered alone in silence. My family was out of town on vacation. I had stayed behind due to work commitments. I was worn out from helping others with their problems all week. For some reason, I was struggling to fight off discouragement, and surprised that I should be feeling such sorrow. As I sat pondering and wondering why I was feeling so sad, I began to think about the Savior and a time of sorrow in his life. Somehow, in some inexplicable way, I began to feel connected to something that happened to him on a similar night so long ago when he too was so alone. I began to imagine the scene in my mind's eye and to rehearse the events that I remembered. I turned to the scriptures to read and reread the descriptions of that awful night. In Matthew, I read, "Then cometh Jesus with them unto a place called Gethsemane, and saith unto the disciples, Sit ye here, while I go and pray yonder. And he took with him Peter and the two sons of Zebedee, and began to be sorrowful and very heavy. Then saith he unto them, My soul is exceeding sorrowful, even unto death: tarry ye here, and watch with me." In an unusual manner, the phrases referring to the sorrow experienced by the Savior caused me to wonder and ponder all the more. I thought, "Why should he feel so sorrowful? What caused him to feel this way? He had done nothing deserving of such unhappiness and sorrow. There had to be some logical explanation, a cause for this effect. What was it? He was a righteous man, a perfect man. When I feel sorrowful, I can usually discover a reason." Another scripture came to mind, this time from Isaiah, "He is despised and rejected of men; a man of sorrows, and acquainted with grief: and we hid as it were our faces from him; he was despised, and we esteemed him not. Surely he hath borne our griefs, and carried our sorrows: yet we did esteem him stricken, smitten of God, and afflicted." There it was again, the reference to sorrow, only this time it was associated with grief. What could be the cause? 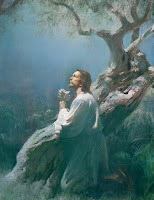 We are taught that in the Garden of Gethsemane, the Savior suffered for our sins. He paid the price of our mistakes. Continuing in Isaiah, "But he was wounded for our transgressions, he was bruised for our iniquities: the chastisement of our peace was upon him; and with his stripes we are healed." We know that we suffer pain, sorrow, guilt, remorse and all kinds of afflictions as the result of doing things that are not in accordance with our value standards. I believe that when I do something that I know to be wrong, I open a chink in my armor, a crack in my spirit, through which virtue and strength escape. Not only that, but that hole in my spiritual protection allows the adversary a chance to attack me, to get at me and to annoy me. Well, maybe not the devil himself, but certainly one or more of his followers have an advantage over me because of my weakness. My light has diminished and some darkness has entered. I know from personal experience that when these little minions of the devil get at me I feel annoyed, discouraged, distraught, sorrowful and sometimes even grief-stricken. All this from doing something that is beneath me? Yes. I think if you ponder it, you will recognize that this has happened to you too. Suddenly it struck me. That was the cause of the sorrow and grief described in the scriptures. Somehow the Savior's shield of light had been diminished that night. On that night in the Garden, Satan threw everything and everyone at his command that he could at the Lord. All the hosts of hell conspired against the Savior and tried to destroy him. His shield of protection, his virtue, was weakened to almost nothing or perhaps even removed, so that he was totally exposed to the full power of the adversary and all those who swore allegiance to him. "...yet we did esteem him stricken, smitten of God, and afflicted." God caused it to happen. That's the part I had not considered before, "smitten of God." Without God removing his shield of protection for a few hours, that covering of light and virtue that he deserved because of his perfection, he could not have felt the full effect of the spirits of darkness. They are full of doubt and fear and pain and sorrow and suffering and anguish and grief because they have no faith. They have no light or virtue, only darkness. It must have been horrible to feel such awfulness. Jesus Christ was exposed that night, and again on the cross the next day, to the full influence of the devil and all the evil spirits that follow him. No wonder he sweat as it were great drops of blood from every pore of his body. The anguish and pressure must have been unfathomable. He did not deserve to feel their influence, but in order to be able to understand how we feel when we are exposed to their power when we sin, he had to be fully exposed. What a terrible thing! Although they attacked him with everything they had, every doubt, every fear, every wicked thought and evil temptation, they could not and they did not get through to his clean, pure and virtuous spirit. He won the battle and gained the victory. He did not give in to their thoughts, their suggestions or their whisperings. Because he won, he has all power. He holds the keys of death and hell. The evil spirits must obey him because he is God, even the son of God. Our Heavenly Father commands us to believe in Jesus Christ, to believe that He is the Son of God and that He has indeed overcome the world and that he did in fact vanquish Satan. We have nothing to fear. This is the good news of the gospel. He won! And because he won his victory over Satan, we can too. He understands perfectly every sorrow, fear, doubt and grief that we experience, because he experienced it too, from the very same source. He won the right to have all power over the evil spirits. He fought and won the victory in the flesh. Michael and his angels fought and won the battle in heaven in the spirit world. Jesus Christ fought that same battle in the flesh and also won. He was not forced and he was not controlled. He did it on his own. God trusted him. We trusted him. He did it. We can turn to him when we feel overwhelmed or overpowered by the temptations and impressions from the evil spirits. How does this apply to you and me? This means that we won, too. He overcame all opposition and yet he gave the blessings of that to us. Because of his great love for us and for our Father, he gave the victory to us. He won against all fear and all doubt. He vanquished all those evil spirits that torment you and me. He has already won the victory over them. The spirits are not limited to a specific time like you or me. They tried to destroy him then and come at us in our time now. That means that whenever those same evil spirits come against you and try to lie and whisper in your ear, saying, "You're no good," or "You can't make it," you can answer and say, "You lie. I can make it. I can do all things through Jesus Christ which strengthen me. He has already vanquished you. Be gone." All doubts and fears have been destroyed. They are on borrowed time and they know it. They are brazen and arrogant but they have no faith or power. There is nothing to fear. Fear has been destroyed. Doubt has been destroyed. These are no longer effective tools of the adversary. Said the Lord, "Doubt not. Fear not. Look unto me in every thought." The Lord has also said that the reason why prayers are not answered is because there are doubts and fears in our hearts. This means that we have allowed Satan's lies to have place in us. We have listened to the wrong voice. Cast him out. He lies. Do not doubt what the Lord has said and do not fear what the adversary can do. If we obey the Lord's commandments, we have his promise that we have access to his power. He holds out his arms to comfort us and to protect us. We have to but come unto him. We do that through faith in him and obedience to his commandments: to be baptized and to receive the Holy Ghost. Once we do our part, we have a right to receive from him the promises of safety and power over the devil. We can trust the Lord. He fulfills his promises. He said he would do it in the great council in heaven and he did it. There was no control, force or compulsion involved. He did it of his own free will and choice. He did it because he loved his Heavenly Father and because he loves us. He trusted that our Heavenly Father would bear him up through the terrible ordeal. He gives us power to fulfill our purpose in life because he fulfilled his. We can rejoice and trust him. He relied on our Father to see him through the pain and suffering of his life and our Father commands us to rely on Him. He will help us through the pain and suffering of our lives. He knows what we are going through. He has been through it for every one of us. He can say that he understands every pain and every suffering, every anguish, every disappointment, every bad thing that has ever happened to us or ever will. He understands, he already met them and won. Great thoughts and testimony. This greatest event in history is something that cannot be understood all at once. It requires pondering -- years of pondering. Actually, such an infinite event probably can never be fully understood. Our faith is an essential element, which leads to repentance, which leads to partaking the sacrament... etc. Consequently, the Atonement should be an active element in our lives -- really on a daily basis. To me, it is the key to improvement. And yes, like you experienced, there are times of sorrow-- sometimes just because of minor errors or inconveniences. Yet, the Atonement is even for people who are fundamentally good and who have those minor setbacks. Further, the Atonement enables us to reach beyond our grasp, and to accomplish more than we otherwise could. The beauty of the "Mormon" perspective is that the Atonement saves us everyday, NOT just once. Are we saved? The answer is a strongly affirmative YES. We are on this earth to learn and to be active. We have no license to sin or to be passive and careless. It is the Atonement that enriches daily life by turning us into activists, knowing full well that mistakes will be made, but also knowing full well that the doors of improvement and learning have been opened freely for us by Christ.